The last Monday of the month is the much awaited Reveal Day for Group D of The Secret Recipe Club! For those who don’t know about it, The Secret Recipe is an event in which food bloggers from the same group are paired (in secret), and have about 3 weeks to choose a recipe from their assigned blog, cook it, and compose a blog. Everyone publishes their post on reveal day at the exact same time. How cool is that? If you want to become a member (beware, there is a waiting list), visit the site and get in touch with Amanda, the founder of this fun group. Heat the oven to 360 F (180 C). Line a baking dish (11in x 7in x 2.5 in) with parchment paper. Break the bittersweet and milk chocolate into pieces, and melt in the microwave with the butter. Let the mixture cool slightly. Chop the white chocolate not too finely. Reserve. In a separate bowl, beat the eggs, sugar, and vanilla. Whisk this mixture in the cooled chocolate/butter, then fold the flour, the salt, and finally the chunks of white chocolate. Pour the mixture in the prepared baking dish, place in the oven and bake for 35 to 40 minutes, until the top is dry and cracked, and the center still moist when tested with a toothpick. Remove from the oven, cool over a rack, and when the brownie is at room temperature, remove from the pan and cut in squares. 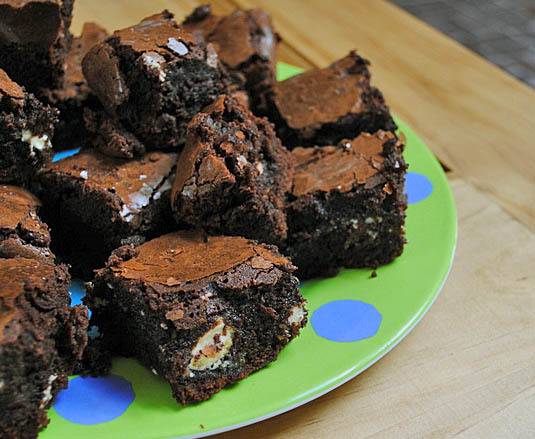 Comments: If you are not too fond of white chocolate, MAKE THESE BROWNIES ANYWAY. They are amazing! We took them to the lab to celebrate one of our students passing his qualifying exam, and they disappeared in a few minutes! The crumbs left on the serving plate were fought over with considerable enthusiasm by two members of our group, normally quite well-mannered. They are fudgy, dense, moist, sweet, decadent, with a nice crunchy surface that provides a perfect contrast with the creamy center. The white chocolate, kept in chunks, is a superb touch, don’t skip it. I didn’t add nuts (macadamia would be the number 1 choice), because one of our students is allergic to them. thank you! I wish I had one of these babies right now in front of me…. omigod Sally. Thank goodness I’m too lazy to convert the measurements. Hahahahahahaha! YUM! I love brownies and I LOVE White Chocolate…gasp, almost even more that regular chocolate. Same here, I know it’s not “real” chocolate, and most choc lovers twist their noses, but I LOVE white chocolate! You are a baker, Sally. You just bake delicious bread, which trumps brownies in my kitchen, at least at the moment — I’ve been making too many sweet things lately. You know, for some reason I don’t consider bread baking the same as “baking” – go figure. Cakes fascinate me in a strange way, as I am absolutely scared of them. I’m so glad you picked this recipe as it’s one of my favourites. It will definitely earn you brownie points 🙂 Your brownies turned out beautifully, I think you are under-selling yourself – you are an amazing baker! These brownies were spectacular! I am very glad I picked that recipe, although I had the “pistachio madeleines” on my list – I had trouble finding pistachios unsalted, and decided to go with the brownies…. What a fun event.. I’ll have to check out your partner.. these are the perfect brownies.. I can tell just by the crackle and shine on top!! That crackled part on top, if I was not the classy person I am, I would peel off and munch on, standing up next to the kitchen island, no need for a plate or a fork. That’s for sissies. I would go for the kill. I’m visiting from Group D, and love what you did this month! Beautiful (AND delicious, I’m sure)! Triple chocolate? I’m there. Yeah, triple chocolate. What else anyone needs? It’s heaven. Lordy, lordy look at those. I wish I were looking at a real plate of the. Ha, thanks for the recipe. Glad you enjoyed the post, Greg! Absolutely decadent! Great job and pick for SRC! His Bday already? Well, I look forward to what you’ll come up for him, I’m sure it will be delicious! You have a great blog and I wish I can overcome my fear of bread baking soon! Thanks for your lovely comment on my blog. Bread baking is intimidating, but so much fun! THere’s nothing I like better than baking bread. It’s a good thing I have a full time job, so bread baking is reserved for the weekend. Otherwise, I would have to go back to long distance running! Oooh these sound delicious Sally. They were too good, Barbara! Too good! I love a good brownie recipe. and I LOVE white chocolate. These sound pretty much ideal in every way! I like them the way they were. “Some people” insist that brownies should always have a few nuts inside, but… that’s debatable. White chocolate chunks win the competition for me. These triple chocolate brownies are a home run! Triple chocolate brownies are my weakness too. These have me longing for one!!! Yes, madam… your wish is my command! Well, if you got the creaming butter down, you are way ahead of me! Give me a sourdough bread to make ANY DAY! You won’t regret making them, I promise…. OMG ! Three different chocolates in one brownie. I am in chocolate heaven. Delicious! I thought of adding some cocoa nibs to them, can you imagine that????? You know I could never pass up a chocolate recipe Sally… but triple chocolate?!! WOW les amies. I especially like the looks of the crackled surface in your last photo – I know all about that crispy, chewy texture… salivating! :). That surface got me too… addictive! I just found Bewitching Kitchen by serendipitous default while searching for another recipe; I’m thrilled to be here. Amazing site and recipes. 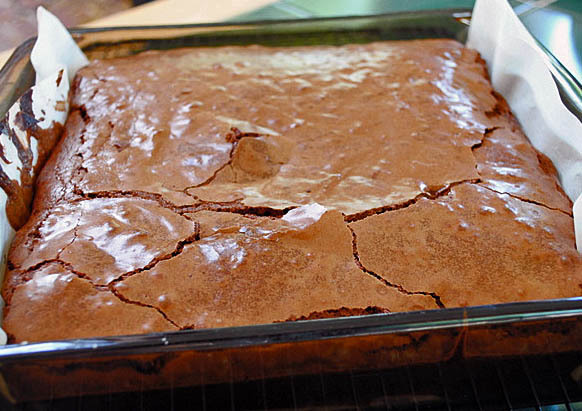 Help … can anyone help convert this Triple Chocolate Brownies recipe. I’ve been to several ‘conversion’ sites and come up with totally different measurements according to each. I want to make these brownies but don’t want to make a mistake in measurements with this one, especially with the price of gourmet chocolate. Sorry to be so metric challenged! Hello there! well, I will do the conversion for you using my most trusted sites, and hope to get a version up in the blog sometime this weekend, ok? Sally – Thank you, thank you, thank you. I will patiently await your post. If you ever find a recipe in the internet that uses metric, this site is very good, as it takes in account which food item you are trying to convert. As I just edited the post today, I won’t be able to test it with the amounts in volume, but I hope they are accurate enough! I appreciate you posting the conversion equivalents and referral site. Thanks to you, my very lengthy ‘to do’ list has just been updated and reordered . . . triple chocolate brownies, post-haste! 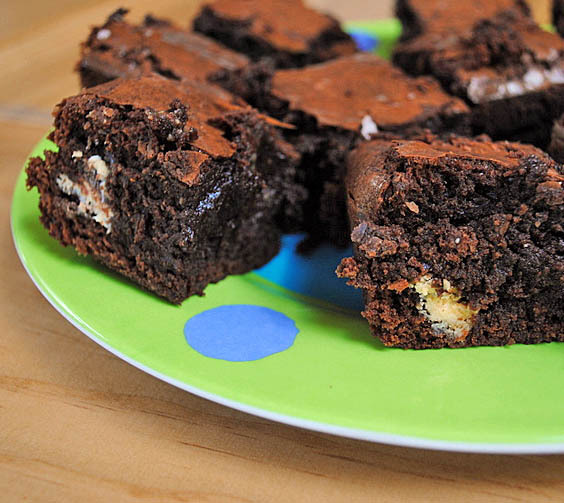 oh my goodness, I seriously can NOT stop drooling over the pictures of these brownies. They look OUTSTANDING! !